MUMBAI: In a rare operation, doctors of a city-based hospital has successfully removed a 12 kg tumour from the abdomen of a 37-year-old woman. Doctors at Global Hospital in Parel area, where the surgery was conducted on December 5, said that the woman, who lives in Central suburbs of the city, complained of a stiff and a continuous bloating stomach for the last 6 months. She however, never experienced any pain. "Around 6 months back, she felt her stomach was growing but she did not have any pain or discomfort. Her family doctor got an Ultra Sound (test) done which picked up a large tumour. Subsequently, we did a CT and an MRI scan and that is how we came to the conclusion that she had Liposarcoma," Dr Nimesh Shah, Consultant General surgeon at Global hospital said. He added that the tumour, which was cancerous, would have ultimately resulted in the death of the woman, had it been not removed on time. "We were aware even prior to the surgery that we were dealing with a cancerous tumour. If this tumour was not removed on time, she could have suffered from bowel complications, involvement of major blood vessels or probably one kidney not functioning," Dr Jignesh Gandhi, a consultant surgeon, who was also a part of the surgery, said. The operation lasted for around four hours and required four bottles of blood for transfusion. "This is a very rare case. The incidence rate is 1-1.5 in a million people. If the tumour had been left inside the body, it could have affected the liver, lungs and brain," Gandhi added. Dr Shah said that the woman has been discharged today and will now be in the care of a chemo-therapist, who will give her radiation treatment to remove residuals of the malignant tumour. "We will keep on radiating here. We have removed the tumour but microscopically, residuals may have been left behind. The chemo therapist will take a call whether an oral tablet can also be given to her," he said. Gandhi said that any sudden and abnormal changes in the body should not be taken lightly and a timely advise from a doctor can help detect and treat such problems at an early stage. He will grow with a remote-controlled Leg, after the cancerous tumour was removed from his knee. BENGALURU: This 10-year-old cancer patient from Sri Lanka has his limb remote-controlled. To ensure that he doesn't undergo surgical procedures often, doctors have increased the length of the magnetic metallic implant on his left leg through remote-control. The implant was placed after a cancerous tumour was removed from his knee. Binura Lakvindu from Colombo, who was diagnosed with bone cancer, underwent surgery at BGS Global Hospital, Bengaluru, recently. "For Binura, we have implanted the expandable prosthesis that has an in-built magnetic disc, gear box and a telescoping rod. The growth anticipated from that bone was calculated and the prosthesis was designed accordingly. He has to visit the hospital once in three months and place his leg in a magnetic coil, and the limb will be lengthened by 1 mm in 4 minutes. The required length will be achieved without additional surgeries. Binura will have limb growth up to 14 to 15 years," said explains Dr Srinivas C H, consultant, orthopaedic onco-surgeon, who operated on Binura. He developed pain in the knee in July, 2014. "We noticed him limping and avoiding cricket, his favourtite sport. We consulted a local physician who prescribed him medicines for pain. But the pain didn't subside and a month later, we noticed swelling above his knee. An orthopaedic surgeon in Colombo suggested that this could be a tumour in his thigh bone and advised treatment in Bengaluru," says Mallikarachchige L R, Binura's father. When the prosthesis is placed in the magnetic field, it leads to rotation of the magnetic disc at 16,000 rpm (revolutions per minute). The telescoping rod moves, resulting in expansion of the prosthesis. The tailor-made implant was imported from the UK to suit the unique specifications of Binura. This technique is tried only on paediatric cases with bone cancer. Hyderabad: India is estimated to account for 60 per cent of heart disease patients worldwide. Heart diseases have emerged as the number one killer among Indians. What is more alarming is that many of the heart diseases occur late in the night or early in the morning. Understanding the need of the hour, and accounting the rising trend of cardiac complications in patients, Aware Global Hospitals, L.B. Nagar has announced the launch of round-the-clock cardiac services. “Global Hospitals, since inception has gained the reputation of pioneering and innovating many clinical programs. 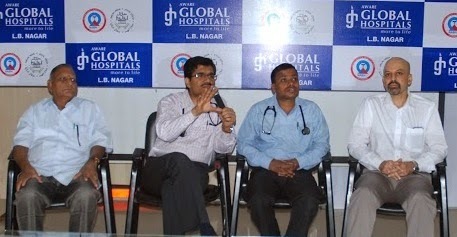 The growing incidence of cardiac problems and high level of complexities has made it imperative for us to further raise the benchmarks of our clinical programs significantly,” Dr. Vijay Vemuri, Chief Operating Officer, Aware Global Hospitals said while addressing the press conference. “With the launch of the round-the-clock emergency services instead of a cardiology being on call we will now offer cardiology services 24X7 with cardiologists present. The team will also have a powerful confluence of cardiologists and cardiac Surgeons who will be supported by the most advanced technology and dedicated facilities, offering the most advanced treatments for simple to most complex cardiac problems,” Dr. Pramod Kumar Rao, Interventional Cardiologist, Aware Global Hospitals said. “If a patient walks in with a cardiac problem which requires a percutaneous transluminal coronary angioplasty (PTCA) we can now do it within one hour as against the international bench mark of 90 minutes. Also 100 per cent occlusions can also be cleared at any point of time with 99.9 per cent success rate,” Dr Rao added. According to Dr. Rao within the vicinity of the hospital in the last couple of months out of a sample size of around 100 cardiac patients treated at the hospital 70 per cent were men and the remaining 30 per cent females. “Out of these 70 per cent men we treated around 50 per cent were senior citizens (above 65 years) and the rest were middle aged and youngsters. But the trend reversed in the case of women where only 30 per cent women were above the age of 65 years and a startling 70 per cent were either middle aged or young women,” he added. Global Hospitals Group is one of the fast growing chains of multi super specialty tertiary care Hospitals in India offering healthcare services of international standards. With over 2000 beds, the Group currently has state-of the art and world class hospitals at Hyderabad, Chennai, Bangalore and Mumbai offering advanced patient care. With the most comprehensive multi-organ transplant services in the country, the Group has carved out a niche for itself by excelling in areas ranging from simple procedures to complex surgeries and multi-organ transplantation services for liver, kidneys, heart and lungs. It has evolved to become a one-stop healthcare destination for people from across the world. Recognized for internationally reputed doctors and cutting-edge medical technologies, the Group’s Hospitals have achieved several milestones by performing rare, pioneering surgeries and transplantations.